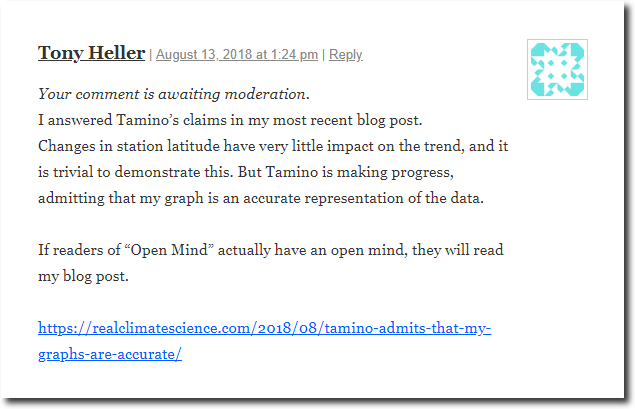 Tamino has acknowledged that my graphs are accurate, but says the data has to be tampered with because of changes in average station latitude. He also says we need to trust the experts. Rather than trusting the experts, let’s actually look to see if Tamino’s theories are correct. 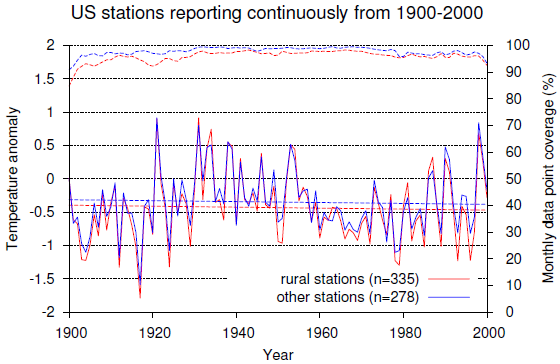 If we look at only the set of stations which were active in both 1918 and 2017, we see a nearly identical trend. The average latitude of this set of 720 stations, has moved slightly closer to the equator, so it should produce an artificial warming trend and works against his theory. The average latitude changes, because not every station reports every day. The percent of hot days at this stable set of stations has also declined. Tamino also complains that I should include warming which occurred before the last 100 years, even though it had nothing to do with CO2. 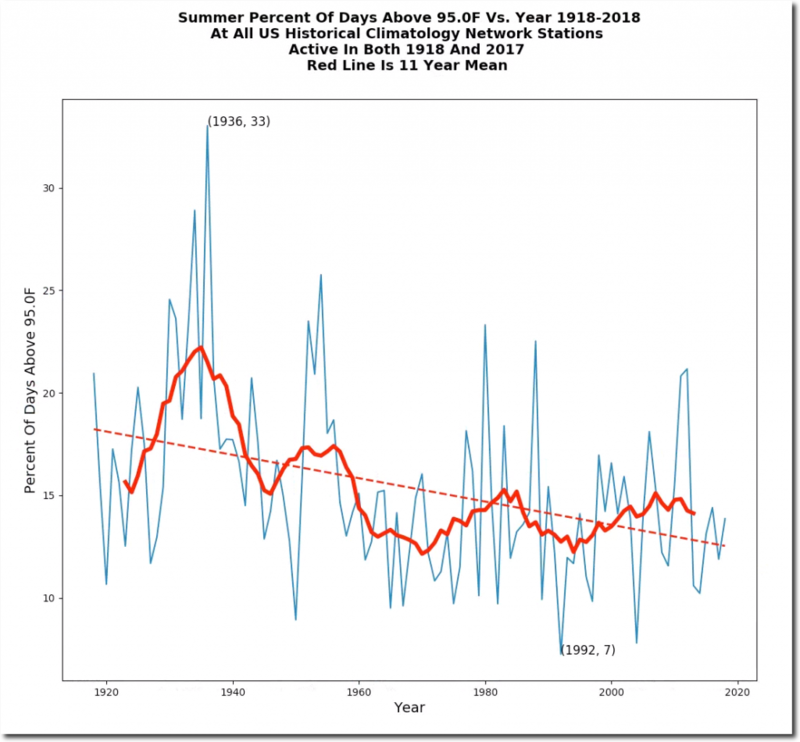 That theory doesn’t hold up either, because summer afternoon temperatures have declined since the start of records in 1895. 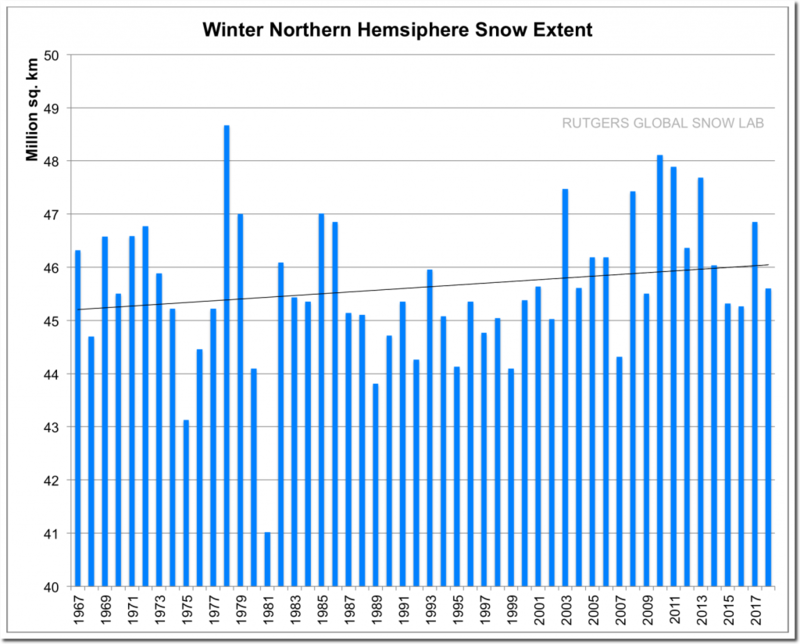 A few years ago, Tamino made a blog post saying that I was lying about increasing winter snow cover. He continues to bat 0.000, but his readers continue to believe his BS. Tamino is making progress however, admitting that my graphs are accurate representations of the data. 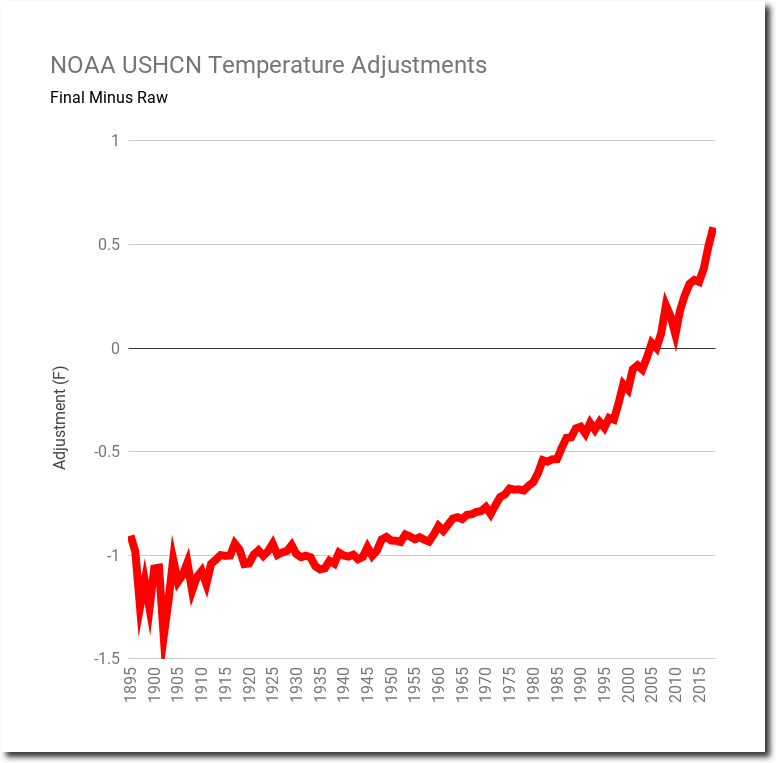 Data tampering by NOAA is junk science. Let’s see if Tamino posts my response. He’ll be reprimanded for attacking you. It works better for them when they try to ignore you. 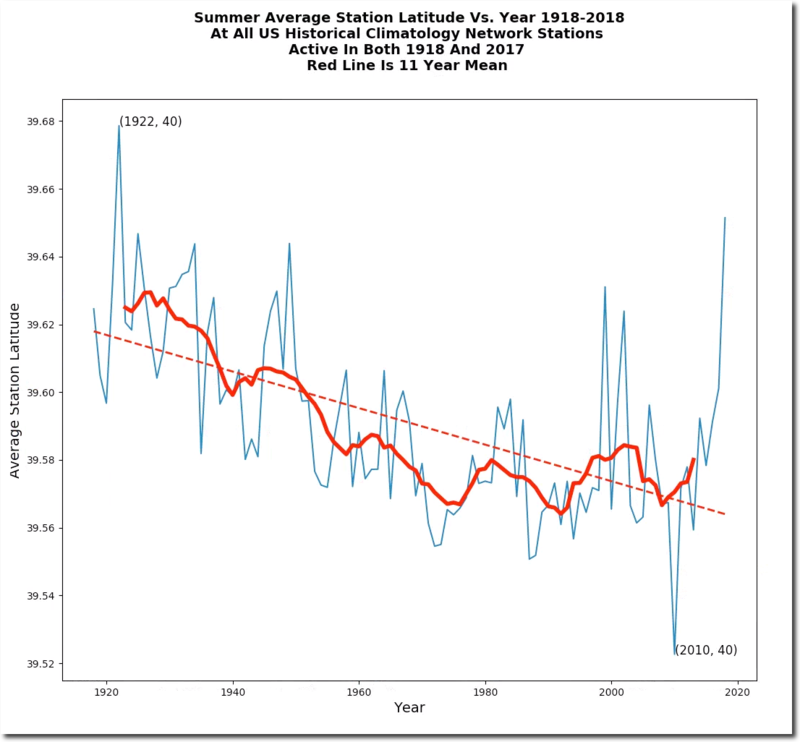 In your latest graphs you plot results for stations that were active in both 1918 and 2018, in that case why is there still a change in latitude over the period? Which ones? That would move the latitude up or down, cooler or warmer, no? Your comment has posted. There are a number of commenters who claim to have been banned here, but I honestly have never heard of any of them. It really is amazing how the warmunists believe that only methods producing warming trends are the correct methods of analysis, regardless of how many more of the other methods consistently produce cooling trends. I block people on twitter who spam me and don’t listen to reason. The warmists dgaf about data so may as well ban them on Twitter if they deny hard facts. As a scientist, I can say that tampering / adjusting data puts the researchers in a very precarious situation. First: Before such adjusting occurs, you need to declare that the raw US surface temperature data is NOT INDICATIVE. 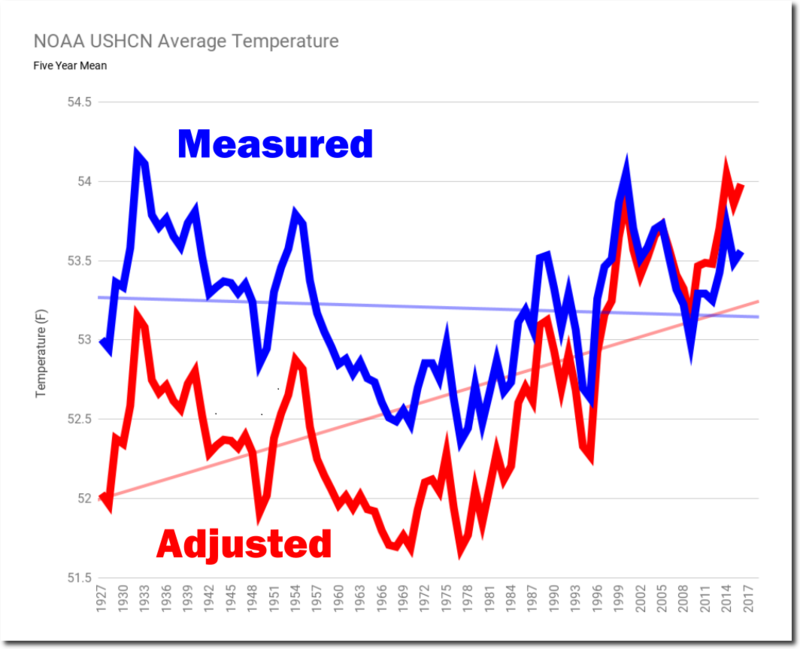 I have never seen NASA or NOAA admit this, but instead publish the adjusted data as the truth. Second: As you have previously been using the raw data, you need to provide a detailed and scientifically rigorous explanation regarding why you no longer trust some of the former data points. <Third: As the adjusted data is now indicative of a trend and hopefully reported as “adjusted data” this is essentially an NEW SCIENTIFIC EXPERIMENT which needs to be compared to another independent data set. 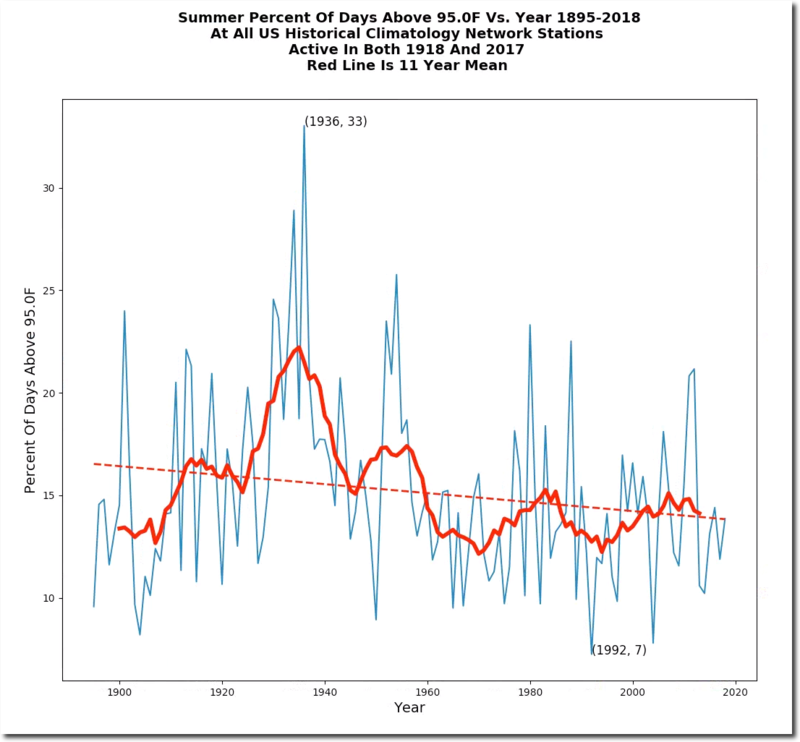 To answer the question: “Was removing the data justified?” This has been answered by NOAA and NASA in the affirmative, as they do such comparisons. 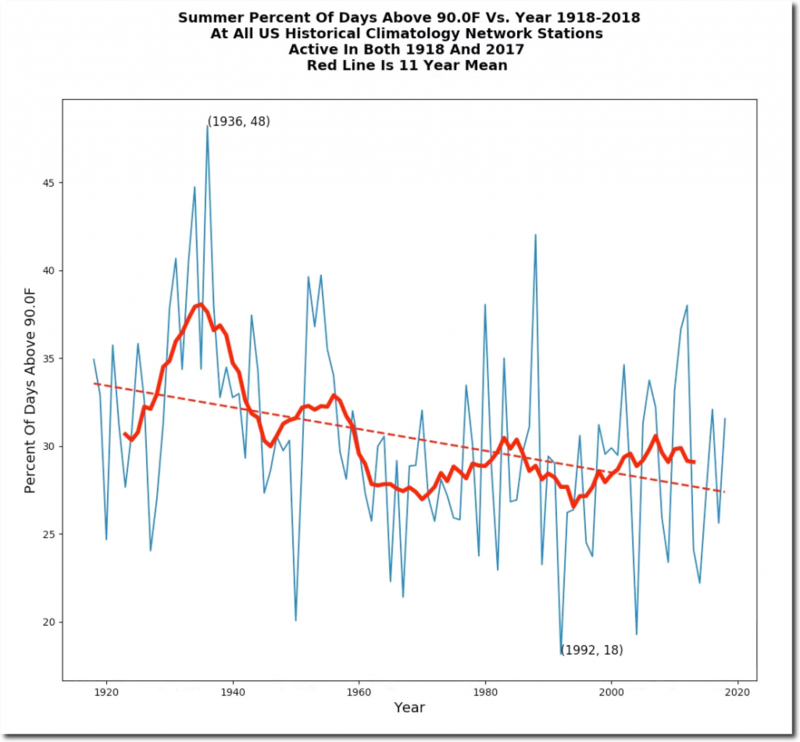 However, ALL of the comparisons that I have seen only occur against other sets of similarly adjusted data – which have also been adjusted to indicate warming. This is essentially self-referential and creates a HOUSE OF CARDS. It is fair game to do this, but the PSMSL needs to notify all of its users that the data has been adjusted to show a trend. Without such a notification, users may use that data set as absolutely indicative, to further one of their own observations or to “adjust” there own data to conform to that of the PSMSL. Right now the climate scientific literature is LOADED with studies where adjusted data sets rely on other adjusted data sets in a circular self-referential manner. So it is not surprising then that ALL OF OUR CLIMATE MODELS over-project the effect of carbon dioxide on global temperature. Once data is adjusted, it is no longer data, it is an artifact of analysis. Great post! One comment in Tamino’s blog cannot understand sarcasm, believing you support the Martian Canal exist theory. The leftists will try to name call and claim you do not have a degree, hence you cannot make any comments. From what I have seen, and I have spent a lot of time on it (not as much as Tony), in order to justify my decision about continuing to teach CAGW, is that all of Climate Science is just a self-referential echo chamber. And what is more scary is that scientists are now using the multi-million dollar Climate Models (like CMIP5) to justify adjusting their trend data. But these very same climate models were built on previously adjusted data sets. So is it any wonder that the climate models ALL over predict warming? Just think what would happen if you built a climate model that predicted cooling or a steady climate state? 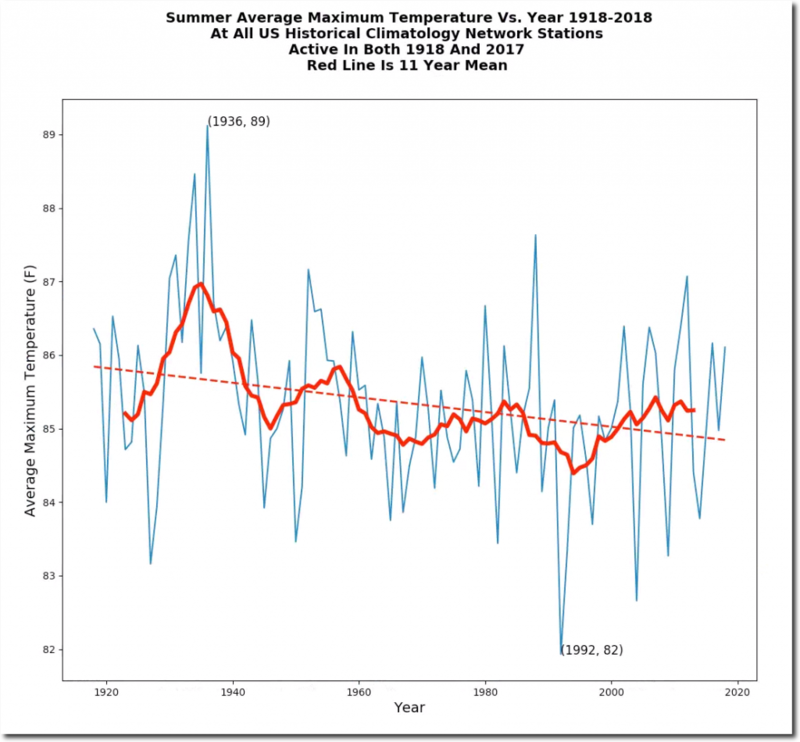 Even if you construct a climate model that says warming will be more moderate than currently predicted by other models, you would be tarred and feathered as the new Heinrich Himmler and driven from the field. “All of Climate Science is just a self-referential echo chamber.” Nailed it! im working on my 3´rd peer rev article and would very very much like if you could contact me on my email. You haven’t explained why you are selecting a subset of data – e.g. summer only, max temp, starting in 1918 etc. Can you share again using the same fixed stations and average yearly temperature, yearly seasonal temperature across seasons etc? Hot weather occurs in the summer. 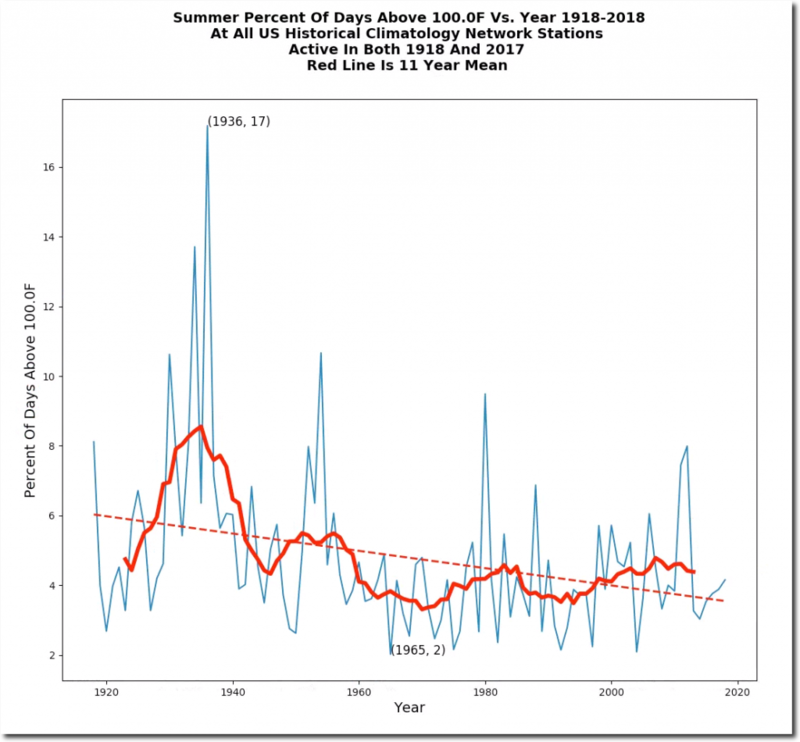 Any warming prior to 1918 has nothing to do with CO2. Why 1918? Use of coal etc didn’t start then. Starting in 1915 seems as arbitrary as 1950. I don’t understand the rationale. And you could easily expect for ceilings in peak temperature that don’t reflect in the average, min etc. Peak temperature is meaningless without knowing how long that peak lasted etc. Surely average temperature (e.g. indicative using min/max temp for day) has more meaningful impact on physical/biological processes. Keeping stations is neat – why not go further and show the different measures of temperature over the full range of data you have? why not go further and show the different measures of temperature over the full range of data you have? That is exactly what we keep asking the alarmists! What is there not to like about slightly milder winters and slightly warmer nights? (if that is what is really happening, which we just do not know since we are not measuring temps properly). Succinct info, Tony. These plots were critical in showing me that the climate “debate” is really an attempted shut-down. I at first was surprised to hear people like Happer and Dyson, then Lindzen and Curry, on the side of the sceptics. It was confusing to me at first: alarmists showed rising temperatures, sceptics showed flatter ones. 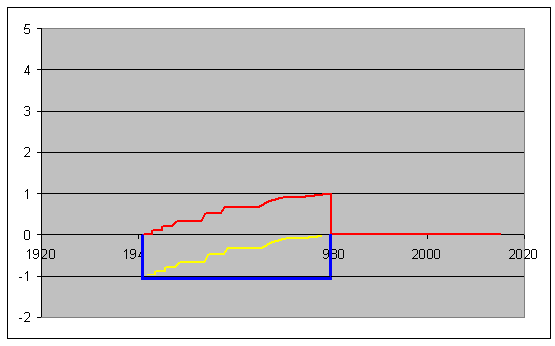 (like the red-blue adjusted vs. raw temperature vs time data you have here). 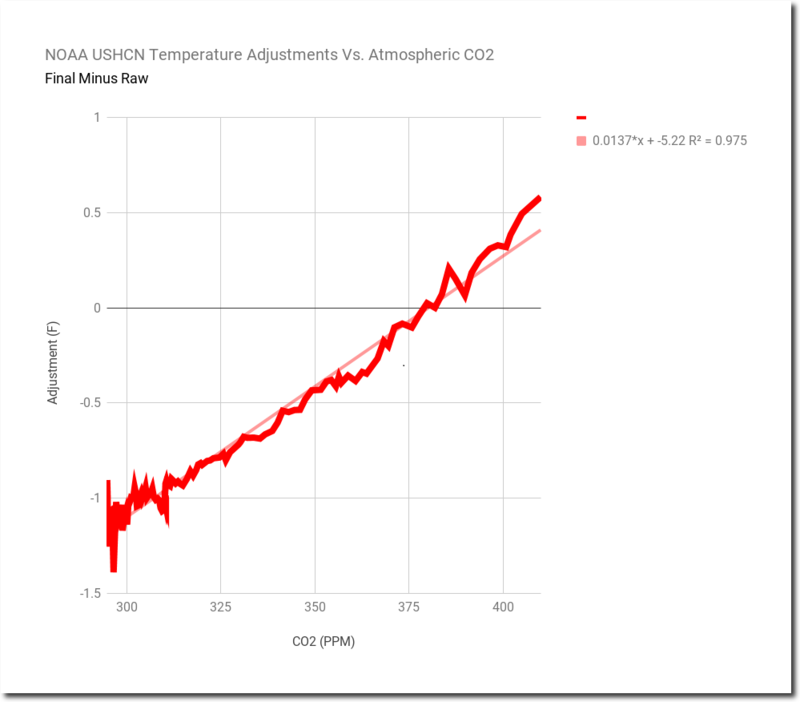 I soon realized that the argument hinged on adjustments, but it wasn’t clear whether these were appropriate or not, until I saw your Adjustment vs CO2 plot in your video presentation. This figure made it clear that fraud was being perpetrated, and that we were being subjected to a massive propaganda con. It also explained to me Richard Mueller’s claim, from Berkeley Earth, how rising temperatures correlated so well with CO2. With this realization, I quickly reached the same conclusions that Anon describes above. Now, I’m still willing to consider data that suggests there might be surprises, but thanks to your historical plots, there don’t seem to be any on the horizon. Well worth watching; lots of interesting history, as always. The adjustment method being used is a very effective way of ‘cooling the past’. Here’s what happens – it’s really quite simple. A weather station is established at a grassy airstrip I 1940 (say). A time goes by the airstrip morphs into a full blown airport with paved runways, huge paved aprons, and all sort of airconditioned buildings. That is to say a huge Urban Heat Island gradually builds-up around the weather station. Then in 1980 (say) the weather station is suddenly moved to the opposite side of the airport, where it is practically out in the countryside. 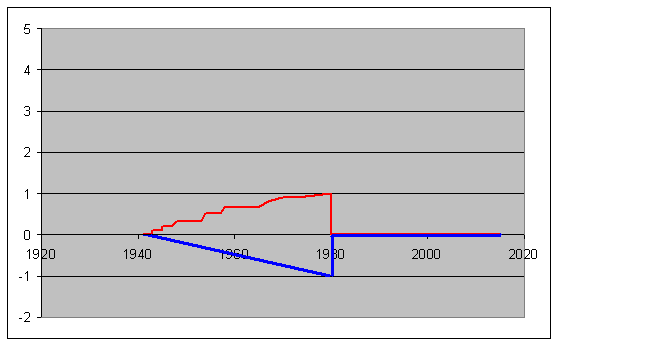 Not surprisingly, a sudden step-down change occurs in the data. Old temperatures are now too high by 1 degree (say). An 1-degree adjustment is now needed. So the graph is snipped at the step and ‘magic-taped’ back together again so that the step disappears. Job done! The error is a gradually rising ‘sawtooth’ profile. The adjustment is a square block. If they really feel they must make an adjustment, then some attempt should be made to match the on-site error. Adjustments should be governed SOLELY by the sources of error affecting the site itself. There should be no need to compare with the data at other nearby stations. You might like to have a look at this site (Rural Unadjusted Temperature Index). It discusses how some of the errors are propagated and not properly corrected. My awakening started with Climategate 2009 and M@nn’s bogus hockey stick. 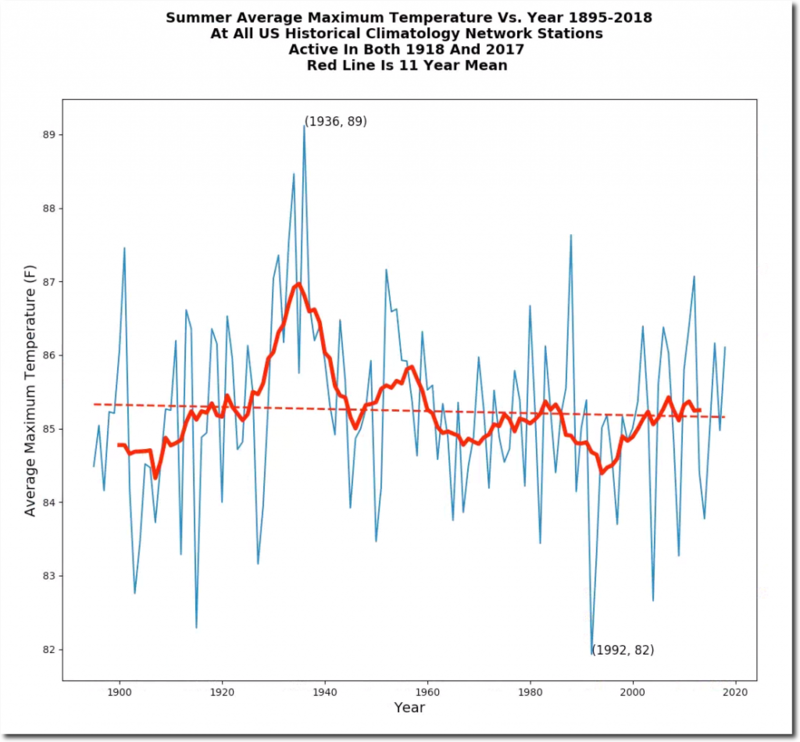 It took me awhile, but I remember finally switching gears – must have been like 2010 – and I asked myself, “well, what do the thermometers really say…” Talk about a trip down the rabbit hole! I downloaded a lot of data. I drove all over my state and a couple by me looking at actual thermometer set ups (Ajo is in a ditch in a mining parking lot; Tombstone is in a fenced compound surrounded by grass outside a Quonset hut; Yuma looks like it’s in somebodies front yard; Sunsites is in somebodies backyard…). I mean really; this is the world’s best temperature measurements? I would be very leery. I wouldn’t give a single site I surveyed any better than +/- half a degree F sensitivity if that; for error analysis I wouldn’t even know where to start (probably with the transducer itself; and a long-term comparison so some kind of witness gauge would be good…) and just about every site had multiple possible spurious heat sources. Just a rat’s nest taken as a whole. You can’t use that ground-based data set for anything except the grosses meteorological analysis. A region’s climate to a fraction of a degree? You’re out of your mind if you think that’s possible. Then I got all enthused about UHI measurement – I outfitted my car and checked it out. It’s lots of fun doing that; but all you really need is you car’s thermometer the effect is so pronounced. I live in the south part of Phoenix (south Tempe actually) and it’s a short drive out the the Indian reservation from my house. I easily clear a delta of 7 degrees F on a summer afternoon. Out and back. It’s uncanny how pronounced it is. These are big numbers. Then there’s the crew that somehow thinks you can take the historical record from Yuma and average it with Tombstone and repeat that process just about ad-infinitude and get a meaningful temperature measurement resolved to tenths of a degree F. It makes my test-engineer’s mind ache just thinking about something so profoundly non-physical. And a completely stupid waste of time. And the “adjustments” and “quality control”. Oh my. Not too much later, I finally figured out what Tony was up to and I let him do the heavy-lifting. And Tony is doing a great job. So what to do? Radiosonde balloons match satellites and those two methods show little warming – background noise around a mean that is probably cyclical as measured by how long humans have been around and writing stuff down – so in geological time, a wink of an eye. Plenty of ice at the poles; and probably no chance it’s going to melt out in my lifetime. People, we’re in an inter-glacial in an ice-age known as the Holocene. This is a climate optimum for life as evidenced by the fecund growth of forests and excellent crop yields we are having. Times are good climate-wise. 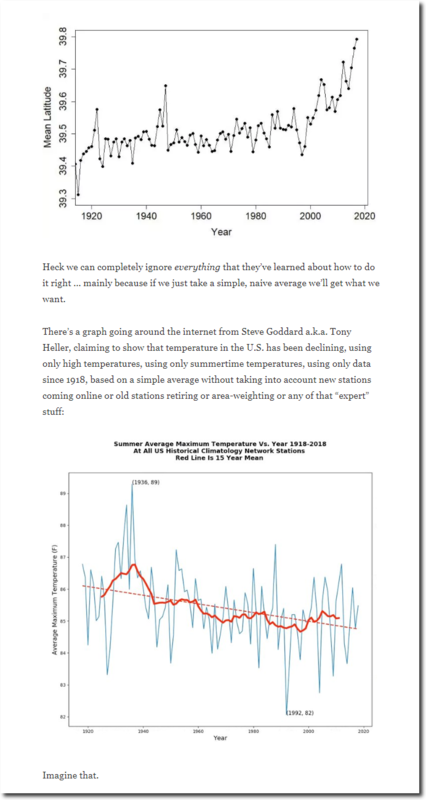 M@ann-made global warming is all man-made by fiddling the data. The climate’s just fine. I tried to do a UHI study here in London, but gave up. To do it properly I had to drive from the Kent countryside, right across London (east to west) to the start of the west country, and back again – several times, all in the middle of the night. I managed to get some kind of results. But it would have needed lots more samples throughout the year. London is big, and gas here is expensive. So I gave it up because I found the cost prohibitive in terms of money and time. Yes and I’m sure it’s a lot hotter here in Phoenix so the effect is dramatic. Did the trip with a warmunist acquaintance of mine some years ago – he just said “huh”. By that time he had actually admitted to me he was only in it for the money and because he hated coal mining. I don’t associated with him anymore. Tamino let a couple of my comments through until I pointed out, in response to a comment about uneven spacing of temp stations, 1% of the world is Urban and 27% of temp stations are in these areas, and large areas are estimated, followed by the MET flag up in their paper on micro-climates that there needs to be an even spread of temp stations to cater for the different micro climates that change in a relatively small distance- seems they didn’t like my comment for whatever reason. 1) I understand the disagreement about the “time-of-day” adjustment for older station recordings. But should that have any affect at all on your “main” graph? After all, it is measuring daily high temperatures, so time of day hardly should matter. 2) This is the first I’ve heard of the average station “moving closer to the equator” effect. How much of the NASA/NOAA modifications stem from that alone? 3) Related question: with respect to your final charts of measured vs. adjusted, and the delta (which you often present as a .gif), how much of the change is from a) urban heat island effect; b) poor station siting, as shown by Anthony Watt and his crew; and c) adjusting (guesstimating) a consistent time-of-day for older station readings?